In 2003, on the eve of the Iraq war, acclaimed director Iara Lee embarked on a journey to better understand a world increasingly embroiled in conflict and, as she saw it, heading for self-destruction. After several years, traveling over five continents, Iara encountered growing numbers of people who committed their lives to promoting change through the arts. This is their story. 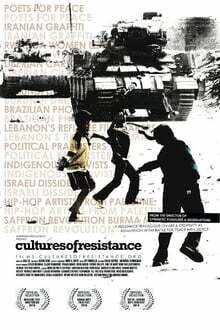 From IRAN, where graffiti and rap have become tools in fighting government repression, to BURMA, where monks acting in the tradition of Gandhi take on a dictatorship, to PALESTINIAN refugee camps in LEBANON, where photography, music, and film have given a voice to those rarely heard, CULTURES OF RESISTANCE explores how art and creativity can be ammunition in the battle for peace and justice.